The Iron Painter is a multi-round online painting contest conducted by Wyrd Miniatures. 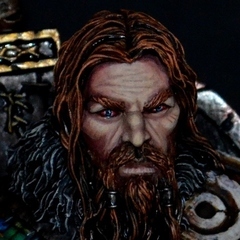 It is a long, grueling competition where painters will be tasked with continuously producing a series of painted models within tight timelines. It is not a competition for the faint of heart (or brush). This marks another year of Iron Painter, and this year is seeing some contest changes in order to better accommodate growing participation and its challenges. This year we’ve taken a number of steps in order to ensure that this is the best Iron Painter yet while still holding on to what makes Iron Painter special. If you think you have what it takes to paint until your fingers bleed (OK, we don’t want your fingers to bleed, but a little bit of a red stain from painting could be appropriate), then you should sign up for this competition. The full rules are detailed below, please read them carefully. Keep in mind that this contest is designed for painters (and non-painters) to have fun. Although each round will have a winner, Iron Painter is as much about finishing every round as it is about winning. It’s a chance for you to get motivated and paint your minis! I, Kai, will be your host during this fantastical contest. I will announce the rounds and handle the logistics as I guide you through a journey of paint and adventure! I look forward to working with all of you and seeing your entries! Without further ado, the rules. In order to sign up for this painting contest, you must post in this thread saying “I’m in!” by September 17th. This will add your name to the list of participants, which we will then use to determine the Round’s pairings. Please use the words “I’m in” so that it’s very clear that you intend to sign up. Your name will be listed in the post below if you’ve signed up. Please do not sign up for this contest unless you intend to follow through. Each Round of the competition will match painters against each other in a deadly battle, and we want to limit the number of drop-outs. Each Round of the Iron Painter will last 2 weeks, except for the last Round. During this time, each contestant will prepare and paint a new miniature. You may not use any miniature that you’ve already begun any work on (including assembly or priming). That miniature may be produced by any company, and it must be uploaded to the appropriate location by the deadline. 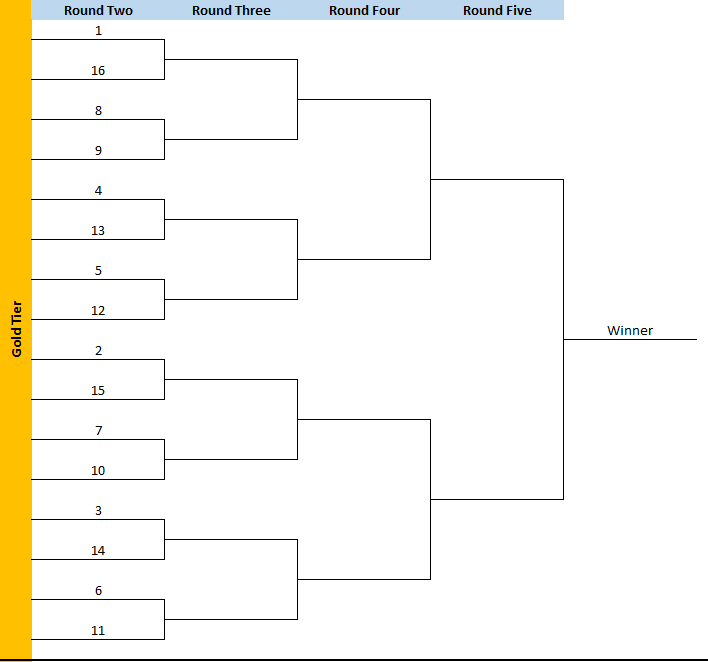 Every Round will be announced with its own thread on Monday, which will detail all the information needed for that Round: the end date, the theme, and the pairings. The start date will always be the time of the post announcing the Round. There will be 5 rounds in the Iron Painter. At the end of each Round, the results will be posted in the original thread that began that Round on the Friday after the Round ends. The First Round of Iron Painter will be a free for all, with painters competing to achieve the top scores. Judging in the First Round will be done by the community and will determine the Tiers that the participants are placed into for subsequent rounds. The miniatures will be judged on 3 criteria: Theme, Technical Skill, and Aesthetic. 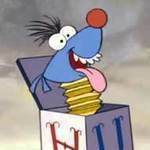 Theme (0 to 10 points) – Does the submission meet the current Round’s theme? How closely does it match that theme? Technical Skill (0 to 10 points) – What is the overall quality of the painting? What is the difficulty of the painting? Aesthetic (0 to 5 points) – How does the mini look, overall? The average points for each miniature will be compiled and used to determine the Round’s outcome. The judging and individual scores will not be revealed, but each submission’s average score will be posted publicly. Bronze Tier participants will be randomly matched up against one another in head to head competitions. The community will vote for which one is the winner (whoever gets the most votes). The loser will be eliminated from the contest. Gold and Silver Tier participants will be matched based on their seed, as determined by their scores in the first Round. You can find the pairing chart below. The entries will then be judged, using the same criteria as the First Round, by our panel of judges (and only our panel of judges). 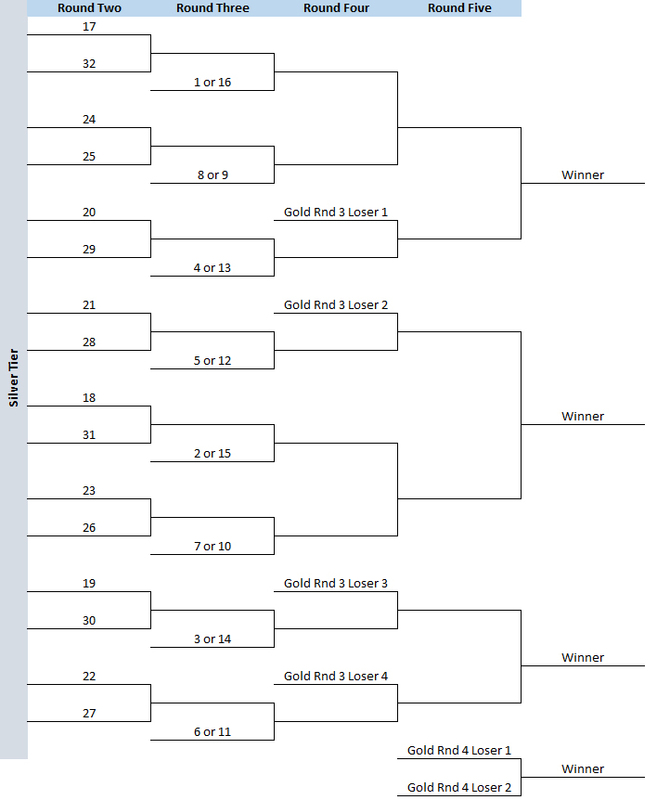 In each pairing, the participant with the highest score will advance to the next Round, and the participant with the lower score will drop down one Tier (from Gold to Silver or from Silver to Bronze). Here are your Judges (who are not eligible to compete or win) for the Gold and Silver Tiers. They have agreed to scoring, but also to provide critique and comments on all the Gold and Silver Tier entries! If there are an uneven number of participants in Gold or Silver, the highest scoring member from the next-lowest tier will be moved up to fill in the gap (so a Silver will move to Gold, and a Bronze will move to Silver). Scoring will be determined based upon the composite totals of all previous models painted. All prizes will be given out at the end of the competition. US-based participants may be required to fill out a 1099. Gold Tier Winner – $500 cash and a goodie bag of miniatures, to be determined by Wyrd at the conclusion of the contest. Gold Tier Runner Up – $300 cash and a goodie bag of miniatures, to be determined by Wyrd at the conclusion of the contest. Silver Tier Winners (4) – $200 cash and a goodie bag of miniatures, to be determined by Wyrd at the conclusion of the contest. There will be four Silver Tier Winners at the end of the contest. Silver Tier Runner Ups (4) – $100 cash. There will be four Silver Tier Runner Ups at the end of the contest. Bronze Tier Survivor – Any Bronze Tier participant who survives every Round without being eliminated will be entered into our raffle 5 times. I Think I Can – Any participant who goes through every Round without a DNF (see below) will be entered in a raffle (unless they received one of the above prizes). Raffle - At the end of the competition, we will hold a raffle and draw 10 names, each of whom will each receive $50 in store credit. Each name can only be drawn once. Every winner (including the Raffles) will receive a Limited Edition Through the Breach Hannah miniature and a handcrafted voodoo doll. Every participant will also receive a forum badge for making it all the way through the Iron Painter. All cash prizes will only be paid via check or Paypal. No other form of payment will be made. Below are some additional rules and clarifications. Submissions for the Iron Painter do not need to be Wyrd products. However, any ties will automatically go to a Wyrd model. If there is still a tie, an internal vote will happen at Wyrd to determine the winner. Some participants will not finish their painting in time. It happens! Anyone who does not finish their model automatically loses their Round and is eliminated from the competition (not just dropped down a Tier). If there are multiple DNFs in a Round, their opponents who did finish their models will be randomly paired up against each other, as long as they are in the same Tier. Iron Painter is a competition, and if your opponent couldn’t handle the pressure, we’re going to go ahead and get you an adversary that is made of sterner stuff. It is possible that this will still result in a participant without an opponent, in which case that participant will automatically win that round (assuming they aren’t disqualified by the Easy Way Out restriction; see below). Any submission that is up against a DNF may be disqualified if it gets a total score of less than 12 points (averaged). This counts as a loss. This rule is intended to stop people who see that their opponent will be a DNF from taking the easy way out and submitting a “meh” piece of work. Any participant that is eliminated may continue submitting entries, and, in fact, they are encouraged to do so! Such participants will be eligible to enter the “I Think I Can” raffle if they continue to submit entries for every Round. If there are an odd number of participants in the Bronze Tier, one random painter will be chosen to Cheat Fate. This means they will be treated as if their opponent is a DNF (which may end up matching them against someone else if there are no DNFs). The Iron Painter does not support, encourage, or tolerate smack talk (even among close friends). Keep your comments positive or keep them to yourself. While the voting for this competition is public, we do have some restrictions on it to limit cheating. Anyone wishing to vote must meet the following criteria: You must have an active Wyrd forum account with ten or more posts (or be an entrant who didn’t DNF on the first Round). Keep this in mind if you would like to vote and have not posted very often on the forums. Take it as an invitation to join in the conversation! If you have met those criteria but still cannot vote, please contact me and we will consult the stars and see about getting it sorted out. We reserve the right to discount any votes that seem to be cheating/aberrant (such as scoring all but one entry 0). 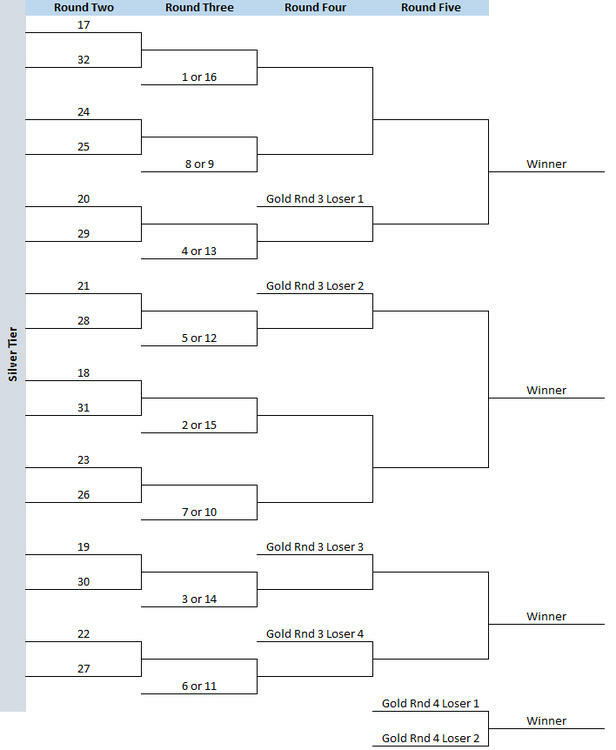 This is the schedule, assuming that the competition goes the full possible 5 Rounds. It is possible that there will be some minor discrepancies during the event (bad things happen), so this should be considered a rough guideline, rather than a schedule that is set in stone. Please allow some delay after the competition’s end for the distribution of prizes. *The rules can also be found in full here. the one, the only, and the first!